Live on Vancouver Island and want to go rock climbing outdoors? There are a lot of places to discover, but this list should get you started climbing near Victoria, Nanaimo, Campbell River and beyond. This post was last updated in July 2018. If you have any corrections, shoot me an email or leave a comment below. Bernard bouldering while the muggles look on. Heading to Fleming Beach with your first rope is a right of passage for new climbers. When you only have an hour or so to kill, bouldering is a great option. It’s fun to grab some takeout, watch the spectacular sunsets over the ocean and see how many laps of the “Jane Fonda Traverse” you can pull off. Erynne at the top of a climb on Mt. Wells with Mt McDonald in the background. Photo by Peruzzo. School Yard is a great place for beginner lead climbers. After you’ve got the basics down, there are some 5.9s and 5.10s over at Cosmic Lights. There is also a notably fun 5.8 finger crack that you can set up on top rope. There is a ton of other climbing at Mt. Wells: mostly harder sport and trad. Check out the guidebook for info. Audrey climbing Vampire in the Sun (5.9) on Mt. McDonald. Photo by Rick Wood. Once you’re leading 10s, many climbers cross the road and hike up to Mt. McDonald. In addition to enjoying some great climbs, you can watch all the crowds scrambling around on Mt. Wells. Hannahbess and Arthur packing up after an afternoon of climbing on Dirt Stamp Wall. Guidebook: Free guide and aerial photo. It’s also in Climber’s Guide Vancouver Island South (MEC). Check the Glenn Lake Facebook group for the newest info. It’s so exciting to have more moderate climbs so close to town. The routes we tried this weekend were fun, sustained and well protected. Can’t wait to go back again. Best for small, quiet groups as parking is in a residential area & the belay areas haven’t been cleared much yet. Sunny Side is just that — full of sun! It is a good place to climb in the spring before it gets too hot. Or once summer hits, you can always cool down with a swim in the Nanaimo River. The Dark Side is another popular area right across the river. It is cool, shady network of paths that weave between the rock walls, tall trees and handmade steps. Conglomerate: the pebbly rock everyone loves to hate. But the views from Mt. Maxwell are fantastic. Beautiful camping at Ruckle Provincial Park. Delicious food at the Tree House Cafe. Bernard working on a project that I wish was a bit closer to the ground. This is hidden gem that won’t stay that way for long. Quadra was on the cover of Gripped last year. This year was also the first Quadra Outdoor Festival that brought 50-60 climbers to the area on one day (maybe a record?). If heading straight to the pub after climbing is your thing, consider camping at Herriot Bay Inn. I prefer the much quieter We Wai Kai campground. Known for: Mostly mixed, trad (5.7-5.10) . Almost everything can also be climbed on top rope. This is the most beautiful crag I’ve ever seen: handcrafted wooden steps, comfortable belay platforms and meticulously maintained trails. The top of almost every route is easily accessible by clear paths and anchors set far back from the edge. When I was starting out, I learned to top rope here. Now I am becoming more comfortable with trad climbing as I test myself on mixed routes (“A BOLT! YAY!”). Camping is available at Buttle Lake. No cell phone coverage near camping or climbing. Phil Stone has a complete list of Vancouver Island & Gulf Island crags on his site. You can also check out Alpine Select if you want to venture out into the Island Alps. Where do I learn to climb? Here is where I learned! Feel free to add your favourite gyms / guides / companies in the comments. 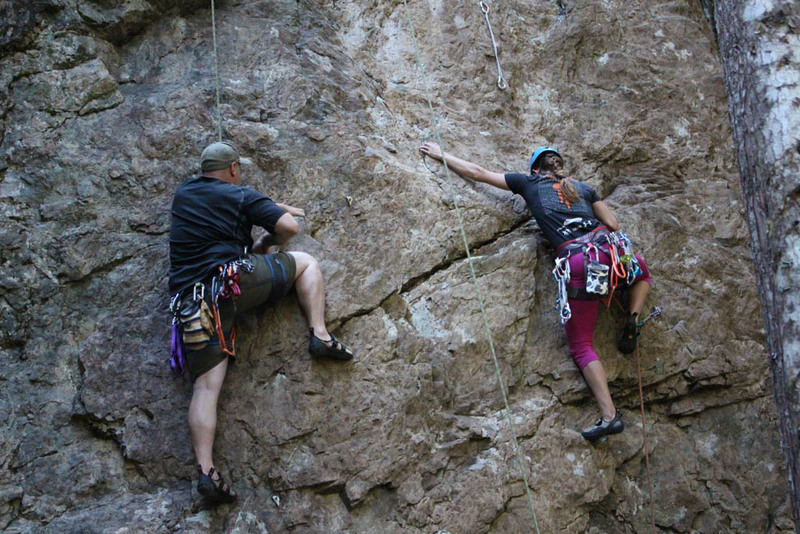 Crag X — Lessons for top rope belay, lead belay and more. Love this gym and am very grateful for their ongoing support. Squamish Rock Guides — I’ve taken their lead, trad and multipitch courses. Excellent experiences each time. Island Alpine Guides — I’ve never taken a course with them, but I know they are well-respected. I love their online instructional videos too. Don’t want to miss the next post? Follow me on Instagram! Close to Maple Bay, the UVic Rock Scaling club extensively developed the nearby conglomerate cliffs at the area we referred to as Sansum Narrows in the early to mid 1970s. Although dozens of new traditionally protected routes were established there of difficulties from ranging from low class 5 to 5.11+, and of heights varying from about 30 to about 300 feet in length, for some reason, other climbers shunned this vast area, presumably because of misplaced fears about the safety of climbing conglomerate rock. Admittedly, the rock could be loose at times, but experienced climbers should be expected to have the required judgement to use this vast area in safety. The UVic Rock Scaling Club visited this area from 1971-75 without sustaining a single injury. As a footnote, the UVRSC faded into insignificance after this period when all of the active climbers resigned in protest against the appointment of non-climbers to executive positions in this organization.